QST is the official publication of the Amateur Radio Relay League (ARRL), the world's oldest and largest organization for Ham radio enthusiasts. Many amateur radio operators also have an interest in astronomy and as such, occasionally articles appear covering topics on amateur radio astronomy. There are also quite a few articles dealing indirectly with aspects of astronomy such as Earth-Moon-Earth (EME) communications where signals are bounced off the moon's surface in order to facilitate transmission (although it is really more of a hobby achievement). The October 2012 edition of QST had an article entitled, "Those Mysterious Signals*," which discusses galactic noise in the 10-meter band. 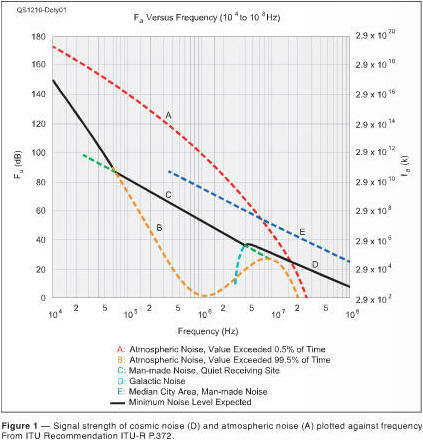 Arch Doty (W7ACD) writes about the low-level background noise that is persistent in the high frequency (HF) bands. At HF, Cygnus A and Cassiopeia A are major sources of cosmic noise, for example. Low level signals come from pulsars, quasars, black holes, and other remote objects that were created during the early formation of our universe. However, the strongest background noise emanates from the center of the Milky Way galaxy with a source that is a mere 27,000 years old. Radio astronomy amateurs measure and publish relevant information as a resource for other amateurs as well as for professional radio astronomers. As with most technical hobbies these days, the state of the art in both equipment and methods is very advanced - often in the realm of professionals. Mr. Doty credits Dr. Darryl Emerson for assistance in the writing of the article, and points readers to two article written for QST by Dr. Emerson (June and July, 1996). The National Radio Astronomy Observatory (NARO) website has a page on their website with hyperlinks to a few articles on amateur radio astronomy,, including the two in QST from Dr. Emerson.